February is one of the rainy months in the Bay Area. But not THAT rainy! If you were keeping track at home, yes indeed, 19 of February’s 28 days were wet. That’s more than two-thirds of the month. And yet, the crews assembled by co-developer and general contractor, SWENSON, managed to keep things steadily moving at Monterey Motorsport Park. Building A’s steelwork, as noted above, is complete. Building B’s steel will be next. Deliveries have also been set for Building C’s steel to arrive on-site in late April and Building D’s steel in mid-June. 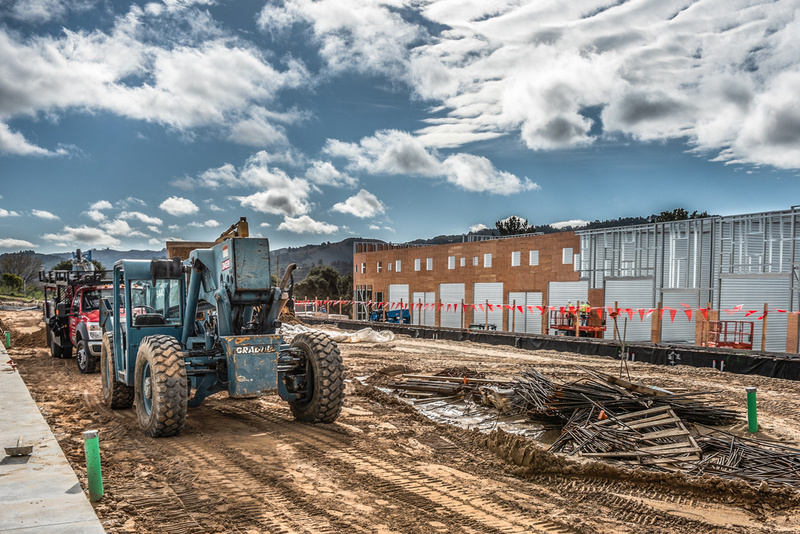 As you can see, excellent progress is being made on the construction of Monterey Motorsport Park — with completion continuing to be targeted for Q4 this year. Stay up to date on the progress by following our live construction cam. Still Waiting for the Right Time to Buy? Well, that time is now. With roughly half of the garage-condo inventory at Monterey Motorsport Park already gone and purchase agreements now being finalized, the selection is dwindling fast. Monterey Motorsport Park truly represents a new vision for luxury garage-condos, perfect for every car collector, motorsports enthusiast or any individual or business looking for top-quality, garage-type storage space in a gated complex with proactive security monitoring. Plus, the big benefit is that with each unit boasting a spacious mezzanine that can be customized into a luxury retreat or personalized office, this is where your friends and business associates will be hanging out on race weekends, during Monterey Car Week in August, or anytime people want to relax and enjoy all the attractions of the spectacular Monterey Peninsula (which when you think about it, is pretty much every weekend). You can also get in touch with Gordon McCall, who’s part of the development team and will be relocating his business — McCall Events — to the community upon build-out, at mccall57@aol.com or call (831) 372-9311. Or you can contact Ralph Borelli at ralph@ralphborelli.com or call (408) 521-7117.